itch.io Recommends: Dungeons, More Dungeons, and... Bob Ross? Up until today I had never thought about A) how badly I needed a Bob Ross Picross game or B) How absolutely amazing of a pun Bob PicRoss is. Well here we are. Happy Tuesday. Bob PicRoss was originally developed for the Awful Summer jam which asked jammers to make unnecessary sequels. Bob PicRoss should probably be booted from that jam as this game doesn’t adhere to the theme: it needs to exist. 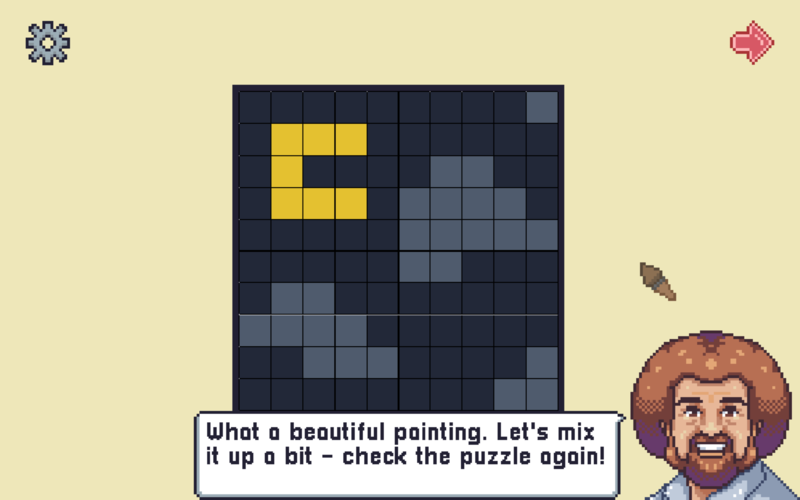 Sure it’s pretty standard Picross action that takes after Hungry Cat’s multi-color mechanics, but that’s not a bad thing! Picross/ sudoku-but-with-drawing is one of my favorite puzzle genres and I’m always happy to hang out with the master of supporting others. Bob PicRoss is available now for pay what you want. Grab some friends, transform into monsters, and if you’re lucky doom them to eternal torment while you escape. It’s Crawl time. 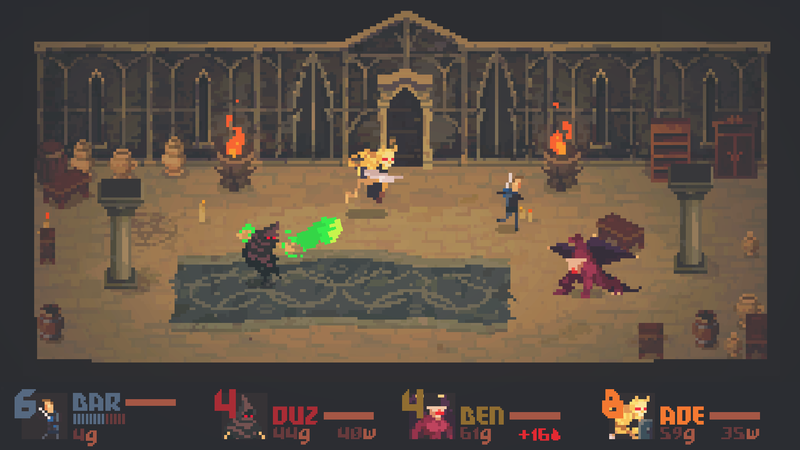 Crawl is a dungeon crawler with one key twist: you play with your friends. One player takes the role of the dungeon crawler while everyone else is a monster trying to kill them. Once the hero is killed one of the monsters takes their place and the cycle repeats over and over until someone escapes the dungeon. It’s a wildly inventive take on a classic genre and plays unlike any other game out there. I genuinely love playing Crawl with friends, and I’ve even had success convincing some of my non-gaming friends to join me in the dungeon. I can’t say enough nice things about Crawl, and if for some reason you want to play the game as me you can enter your name as SPN to see my horrible pixeled visage on your screen. Grab some friends because Crawl is available now for $14.99. 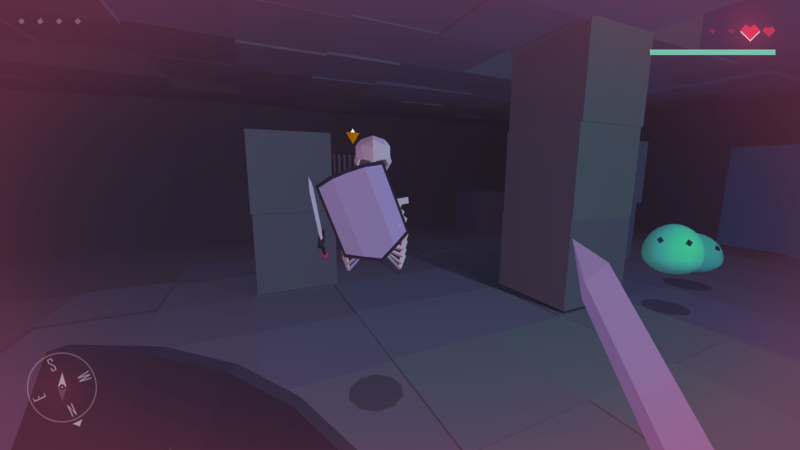 If you prefer your dungeon crawling in first person rather than top down Grym will be your jam. Pick up your blocky and cute sword and explore catacombs filled with blocky and cute monsters to unearth a series of blocky and cute treasures. Are you seeing a pattern here? Grym is a fun little romp that can fill up an afternoon by itself, and if you’re more technically inclined you can pick up the game’s source code for $3. The developer promises this code is messy, and I can’t vouch for that, but you might be able to learn something while you have fun. That’s a win-win. Grym is available now for pay what you want.